With this methodological and didactic book, Catherine Saublens would like to present the psychomotricity with a pony - equimotricity© method as she practices it, to a wide audience: people working in riding schools as well as people especially interested in psychomotricity. 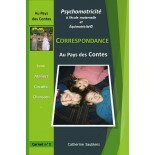 The originality of this book lies in that it can also be used by teachers. Yes! All exercices can also be performed indoors without a pony! She tried to cover the whole subject in a kind of "directions for use". Firstly in this book, shet starts with the major thermes of the psychomotricity and show how to combine them with the pony. 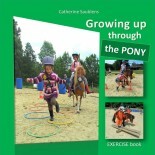 Secondly, in the "Exercice book", she presents 30 psychomotricity lessons with a pony. Concrete examples are illustrated with diagrams and pictures. Catherine Saublens hopes that after having read this book you will feel like trying the experiment with your own children or your little students. Catherine Saublens is a specialized educator, physical education teacher, psychomotrician and equimotrician©. She came back to the horse world about 10 years ago. Together with a friend, they imagined a new manner to deal with the pony! Horse riding is set aside and they jump wiht both feet into operational psychomotricity! The pony becomes than the natural partner of the child. It helps him to develop as a person and to grow up.